Kenya Airways subsidiary, Jambojet, has widened ticket payments options with the introduction of MTN and Airtel Money services. This will enable travelers to book flights online, at call center or at their offices using the two mobile money optionsand obtain an e-ticket. Jambojetrecently launched its operations in Uganda and is operating a double daily flights departing from Jomo Kenyatta International Airport (JKIA) at 06:00 hrs and 17.30 hrs. The flight departs from Entebbe International Airport for Nairobi at 07:50 hrs and 19.20 hrs daily. Jambojet CEO, Willem Hondius, said the mobile payment solution has been introduced to give a much more flexible payment method to the customers. 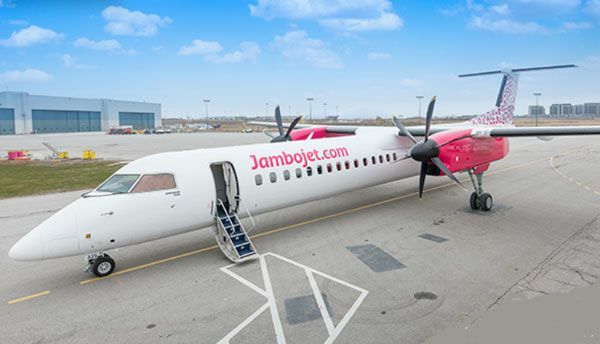 “Our customers will be able to easily book and pay for their tickets anywhere and anytime.Jambojet is committed to continually innovating and improving our products and services to enhance the travel experience for our passengers,” he said. In order to enjoy the new service, travelers will need to dial *223#, choose paybills, select Jambojet bill, then select payment method (MTN Mobile Money or Airtel Money) and enter Pin to complete their transaction. Once the payment is processed, the customer will receive an SMS confirmation along with the e-ticket via e-mail. The main purpose of this payment option is toease the booking and payment process for the customer, increase flexibility and allow customers to book and pay for tickets online anytime 24/7 and also offer seamless experience to customers from booking, check-in to on-board service. He also expressed optimism that the Uganda market will enjoy the ease and convenience that comes with the use of this service. Jambojet currently operates a relatively young fleetof four Bombardier Dash 8 Q400 aircraft. The route will be served with the recently acquired 78 seater; turboprop Bombardier Next Gen Q400 as it plans to venture into other regional destinations. The barely four-year-old airline which currently operates to Entebbe, Eldoret, Kisumu, Malindi, Mombasa, Nairobi and Ukunda has achieved undeniable business growth; increased numbers of routes from four to seven, increased frequency of flights due to fleet expansion and has flown over two million passengers.